Nicklaus had been fishing in the Bahamas but caught the end of Woods' round and said he was in no doubt he would win. "There wasn't any question in mind, after seeing (Francesco) Molinari hit the ball in the water at 12, and Tiger put it on the green," he said. "I said, 'Tournament's over'. It doesn't make any difference what anyone else is going to do. Somebody is going to make enough mistakes and Tiger won't make any, and he didn't." "What a great moment for the game of golf," Mickelson wrote. "I'm so impressed by @TigerWoods' incredible performance, and I'm so happy for him to capture another Green Jacket. "Truly a special day that will go down in history. Congratulations, Tiger! #rematch"
And his former coach Butch Harmon said on Sky Sports: "I've never seen him show emotion like that. At any time, anywhere, any time in his life. "He was humbled by his own mistakes, the things he went through he created, nobody else created them, and he came out the other side. Reaction came from far and wide, with current and former US presidents also celebrating Woods' victory. President Donald Trump wrote on Twitter: "Watching final hole of @TheMasters. @TigerWoods is looking GREAT!" And his predecessor Barack Obama tweeted: "Congratulations, Tiger! To come back and win the Masters after all the highs and lows is a testament to excellence, grit, and determination." 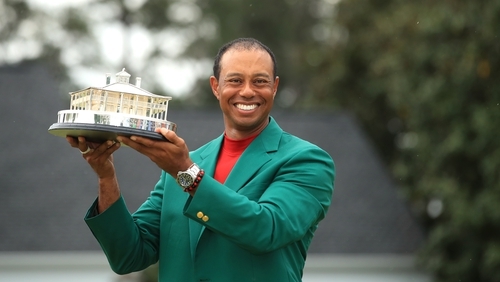 Many were quick to ask if Woods' victory was the greatest comeback in sporting history given the hurdles he has faced and overcome since winning the US Open in 2008. Twenty-three time Grand Slam winner Serena Williams wrote on Twitter: "I am literally in tears watching @TigerWoods this is Greatness like no other. Knowing all you have been through physically to come back and do what you just did today? Wow Congrats a million times! I am so inspired thank you buddy." Three-time major winner Padraig Harrington said on BBC Sport: "There is not a golfer in the world that isn't happy that Tiger Woods won. In the modern era he's been a golf and sport superstar.